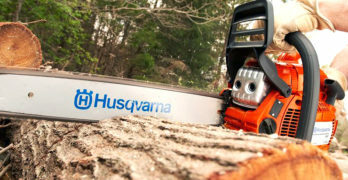 We show you some of the best farm toys that kids will love. Perfect for birthdays, Christmas or just a thoughtful present to say “I love you.” We hope you find that special farm toy gift as we’ve done our research to hand-pick some cool gift ideas for you. There is a common fascination between children and farm animals. In fact, farm toys seem to be well favored among most children. Pretend play with cool farm toys for kids such as farm sets creates the perfect opportunity for toddlers to learn about common animals through carrying out the animal sounds and various actions commonly associated with those specific animals. As a crucial role in fostering their development, the right toys can help curb your child’s imagination through play. You may not think much in a toy your child plays with but for budding minds a toy can play a big role in their growth. Different toys can serve to help children achieve and improve necessary skills through play by their design. The beauty in farm toys is that there are so many to cover all important areas of development. These are also an easy go-to for kids of various ages that are neutral for boys and girls. Imaginative play – this is an important skill for children to gain which can easily be achieved through toys. Toys that promote pretend play are curbing areas of development that will help them use social skills and role play. When children play and pretend with another child or with a parent it’s also fostering their language skills as they express different actions and ideas. Cause and Effect – Toys that make noises and sounds may not seem too appealing to parents after a while but when the sounds are activated by pushing or opening something it’s a teaching mechanism for kids. This is why so many toys have features that will play music or sounds when an action is performed. Fine Motor Skills – these are the skills necessary for dexterity to grasp small objects and perform tasks like fastening buttons and holding a pencil or crayon. Toys aimed for improving fine motor skills help to strengthen the muscles in the hands and fingers in order to carry out these tasks. Farm toys provide a lot of fine-motor skill development through their various functions. Realistic die cast toy tractor. Quality timeless toy. Gross Motor Skills – These are the movements of larger muscle groups and coordination between movement of the arms and legs. Toys that work and stimulate gross motor skills are valuable in helping children build endurance, balance, coordination, and strong muscles for activities like crawling, running, walking, standing, jumping, and sitting. Problem-solving – There will be much use for problem solving skills in life even from an early age. Toys that implement imaginative play also encourage problem solving skills. Many cool farm toys for kids provide problem-solving opportunities through pretend play and actions like building corrals to contain the farm animals or keeping the horses in the stables. One factor that makes farm toys specifically great for feeding into your child’s development is the realistic component they provide. The actions associated with typical farm duties and simply looking after animals correlate to real-life situations like responsibility, performing specific tasks and a way of life. Children instinctively learn about their world around them just by observing and absorbing what they see. You don’t have to live near the country or on a farm to understand how things may work or what happens on a farm. Children do come to find some interaction or experience with animals whether it’s visiting the petting zoo or watching cows grazing in a field during a car ride. Whimsical farm toy set for kids. A portable farm where your child goes. Wonderfully designed. Fisher-Price is well-known for making toys geared towards children from babies to toddlers and even grade schoolers with fundamental elements included that stimulate growth and development. The Little People Animal Friends Farm is no exception with the classic-style red barn that is easy to recognize. It’s one that has engaging activities and is suitable to grow with young children from a year old and up. Stickers that match the animal to its stall in the Animal Friends Farm allow them to recognize and identify the animals along with sounds that correlate to the sound they make such as ‘moo’ or ‘neigh’. Captivating farm toy for kids. Plenty of stuff they can interact with. Immerse your child in this fun farm track experience. This set combines two popular favorites among kids – farms and train sets! The set comes with an easy-to-assemble track that can be adjusted for a multitude of possibilities and problem solving skill-building. The track pieces are interchangeable with other KidKraft sets and easy to piece together for endless fun. There is a lot going on in this set for incredible imaginative play and role playing on so many levels from gathering eggs from the chickens to driving through the mountains. Open-ended play components let your child build their own little world and can also promote cognitive development as they recreate the scenery. It can easily be expanded to cater to growing minds with more imagination and adventure. Interactive farm toy train track set. Beautiful and well-made farm toy for kids. Completely made in the USA — from 100% post-consumer recycled plastic milk jugs. 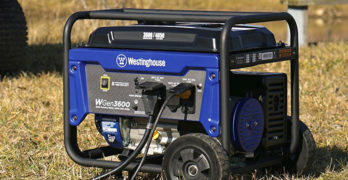 Very safe, versatile and fun; with no metal axles (no rust) or external coatings (no chipping or peeling). This toy has been designed to be free of any harmful chemicals. This toy is as green as it gets. No external coatings, paints, or dyes. Learning important tasks are a requirement on the farm when it comes time for harvest. This simple little orange tractor has a detachable trailer that is perfect for indoor and outdoor use to put your little harvester to work. Encouraging problem-solving skills, this tractor can carry small loads from point A to point B. Fine motor skills are achieved through attaching, loading and hauling the trailer behind the tractor while the physical action of pushing the tractor along puts those gross motor skills to use. Lastly, it’s also packaged with recycled and recyclable materials with no plastic films or twist ties, and printed with soy ink. 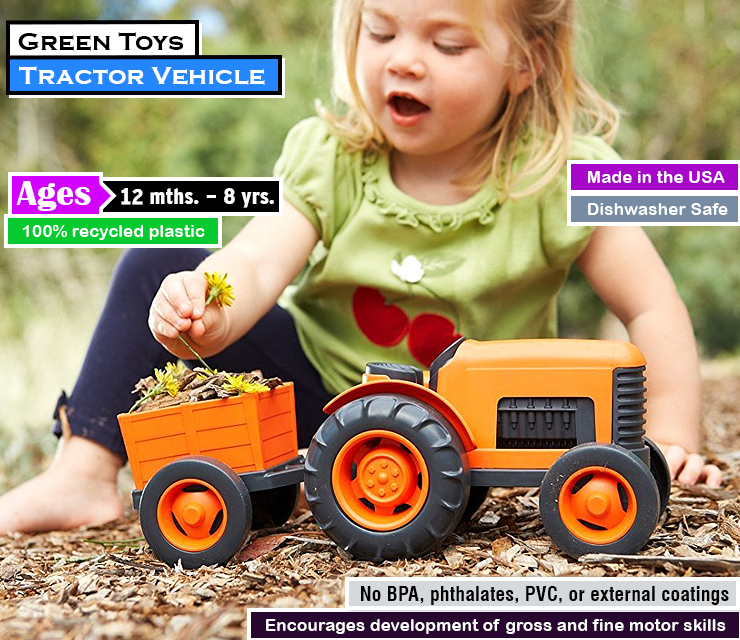 It’s nice to know that the Green Toys company is doing their part in fostering learning in children while simultaneously helping the local economy in a sustainable manner. It’s great for everyone, especially you, the parent and consumer looking for quality products for your child. See more toys from Green Toys on Amazon or visit their site to learn more about the company. which are all made in the USA. The bold design makes this farm toy tractor a great buy. The attention to detail is impressive. Have a look and decide for yourself. A fantastic farm toy for kids that will complement other Schleich farm sets. Wonderfully designed and realistic set. Beautiful! A nice compliment to the tractor vehicle toy above or an addition to any farm set, this feed set contains accessories that you would find on the farm. Provide feed for your child’s toy animals with the realistic detailed hay bales and harvest produce with these vegetable crates. Feed your child’s imagination as they role-play with this feed set. Makes for a great addition to any farm toy set. Toys consisting of characters or toy figures are a great way to engage your child’s imagination. This is especially true in toys that are not equipped with too many extra features and bells and whistles. Melissa & Doug toys are a great way to fuel a child’s imagination and creativity with simpler-made toys. Their toys are designed to inspire imagination and encourage creativity through activities that are encountered in actual day-to-day life from life on the farm to life in the kitchen. The quality and craftsmanship in their products also provide long-lasting toys to create memories that can be passed down to generations. Beautifully illustrated magnetic pieces will captivate and enthrall young minds. A farm toy for kids well-worth your money. This farm toy set offers endless creative play opportunities. Magnets are exceptionally great toys for young learners because they can stick to any magnetic surface, keeping less mess on the floor. The magnetic factor itself provides a learning element for children as they discover what types of surfaces and objects they will ‘stick’ to and what won’t. These can keep a child entertained for long periods of time through skillful activity. They’re great in stimulating hand-eye coordination along with fine motor skills to grasp objects. The wooden farm magnets in this Melissa & Doug collection encourage storytelling. Simple farm toy set is perfect for young children. Kids love playing with animals. Kids simply love animals. This will take your child back to a simpler time. Another great farm toy for kids. Includes : a cow, a pig, a goat, and a horse. 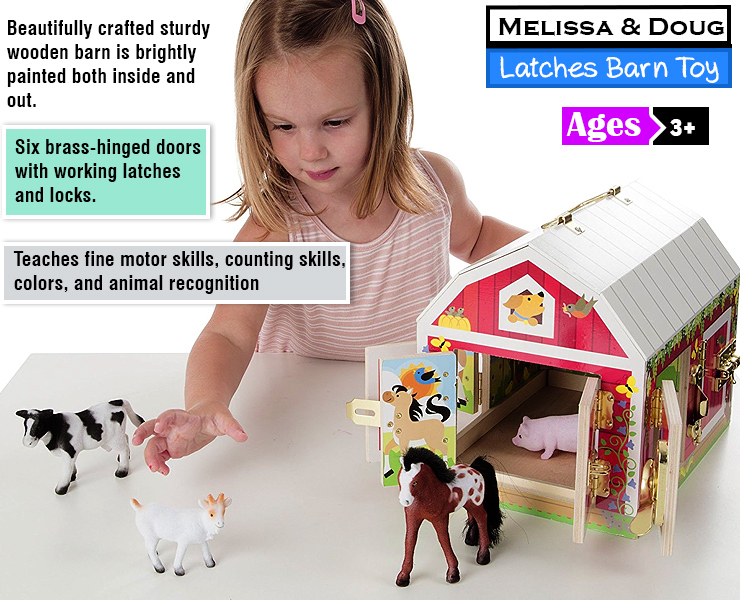 This Latches Barn implements the simple mechanism of latches and locks which are incredibly effective in enhancing fine motor skill development. The hinged-latches and locks are easy enough for children ages 3 and up to unhook for opening and closing the doors of the barn. It also includes 4 toy animal figures to encourage pretend play. Nicely designed and colorful farm toy set. Wonderful attention to detail. Promotes memory and fine motor skill. Magnets are fun and a learning experience. Latches and hinges are fun and aid in fine-tuning key fine motor skills. The Melissa & Doug Hide & Seek farm brings these two elements into one with a simple yet very engaging activity for children between the ages of 3 and 5. The hinged doors open to reveal barnyard animals hiding inside which can promote cognitive development as they seek and find their farm friends. Additionally, the magnetic pieces are specifically shaped to fit in their designated spot on the board adding a problem-solving element. The magnetic component of the pieces sticking to the board also makes this a great toy to take on the road. I love the blocky design of this farm toy for kids. Made from wood and designed to perfection. Overall, a really nice toy set that kids will love. Folding corral can be adjusted to any number of shapes! The realistic characteristics in the Fold and Go Wooden Barn invite children to play out different scenarios using the farm animals in ways they may see on an actual farm. This type of set would be suitable for children between 3 to 6 years of age with greater detail that seems less like a baby or toddler toy. There’s also an adjustable corral that can be attached in multiple ways and into different shapes. Love the stylized look of this farm toy set. An instant classic. This a very cool farm set. Colorful and nicely illustrated. One of the best farm toy for kids. Sturdy and bold pieces make it easy for kids to play with. Build the barn and enjoy hours of farm play. 36 pieces, including a colorful barn, fences, stable, silo, trees, tractors, and animals. For some hands-on engagement, here’s a toy your child can put their problem-solving skills to the test by assembling the barn to build their own farm. Blocks provide excellent skill building value for children. This playset combines that value in a fun farm set that promotes creative thinking with numerous possibilities. They’ll also gain hand-eye coordination and balance as they stack the blocks. Blocky look and styling is immediately inviting. Kids will love this farm toy set. Each of the eight horses is modeled after a specific breed. There’s something magical and awe-inspiring about horses that captivate young animal lovers. This stable playset provides some valuable facts to learn more about specific breeds of the horses such as the ones provided. Encouraging role-play and fine motor skills with swinging doors and latches, there are a lot of valuable features this set provides for children from 3 years of age and up. Kids love horses so I’m confident that your child will immediately fall in love with this wonderful toy horse set. Sturdy wooden handles make it easy carry. This two-story wooden horse stable has many features that encourage play and provide possibilities for learning. The stable is fully assembled so it’s ready for play for children ages 3 and up and comes with an adjustable corral. The two-story barn has multiple stables to place the horses with realistic characteristics for role play and encourage counting from the number of horses to the number of stables among other elements. Classic styling ensures that this farm toy design will remain in vogue for a very long time. Learn more about the Melissa & Doug Brand. They have some wonderful toys for boys and girls of all ages. As one of the major brands in manufacturing farm equipment, it’s no surprise that John Deere has become available in kid-friendly toys that encourage and stimulate skills they’ll gain through play. 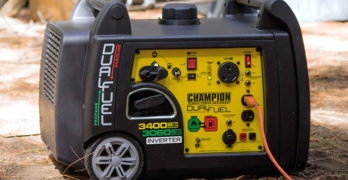 An added sense of development that comes into play with John Deere farm equipment and toys is imitation. Children love to imitate what they see and instills a new element of learning. If it’s not uncommon for dad or grandpa to be found loading the front loader or carrying a load in the tractor trailer, you can bet there’s a future farmhand nearby eager to be able to join the fun. This one is more likely to be loved by boys. Whoever you buy this for, I’m sure they will appreciate it. Well-made and lots of fun. One of the best farm toys for kids. Plenty of animals and vehicles to keep your child entertained for hours at a time. 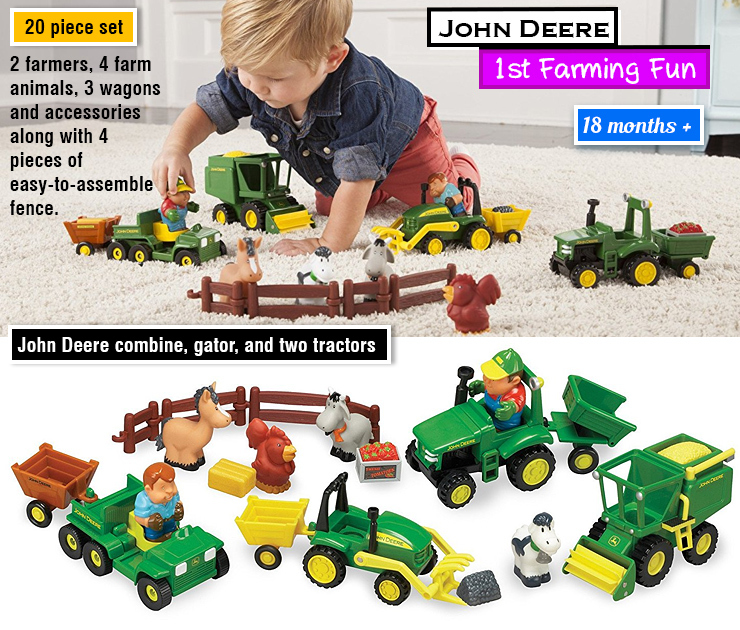 A love of the farm and John Deere can be instilled from early on with this 1st Farming Fun playset that consists of 4 toy John Deere vehicles, farm animals, and accessories. With toy cargo and feed for the animals there are multiple ways to play with the set that lay the optimal foundation for pretend play, problem solving, and fine motor skills. The set is suitable for babies and toddlers from a year up and can provide long-lasting engagement as they grow older and learn how to utilize the toys in different ways. Additional sets can be added to expand your child’s collection for more farm-related action. John Deere is probably the most popular toy tractor design. It’s an iconic brand that everyone is familiar with. This adorable 6-piece farm set includes a farmer, a tractor, and 4 farm animals for easy animal recognition. Toddlers can push the tractor to tow the animals along. The toy animals can be removed from the wagon which has pictures to indicate the spot for each animal. When the correct figure is placed in its spot it makes the animal sound to reinforce animal and sound recognition by cause and effect. Press the farmer to hear the classic tune of ‘Old McDonald’. One of the coolest farm toys you’ll find. Fully working ride-on tractor. You don’t have to live on a farm to experience the joys of driving a tractor. This powered tractor has many realistic features including an accelerator pedal and steering wheel to give your budding farmhand a taste of the real deal. The attached trailer allows children to move objects around the yard and carry out specific tasks. Coordinated movements through operating the functions provide valuable problem solving skills that are easy enough for children from 2 to 7 years of age. Read our in-depth reviews of the Peg Perego ride on tractors. Comprehensive farm toy set : Vehicles, animals, buildings and fences. Complete farm toy set with, vehicles, animals, buildings and fences. This value set is a bit more complex but provides great value that can grow with your child from toddlerhood into their teens. 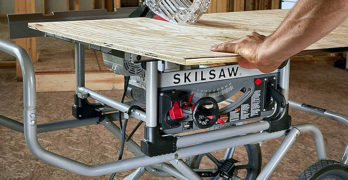 The durable construction is very realistic and provides skill and problem-solving to assemble together. The 70-piece set comes with a large machine shed and multiple farm vehicles, animals, fences and accessories for open-minded possibilities. 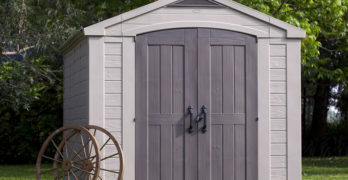 The doors actually slide open and closed on the shed with a detachable roof for easy access to place the vehicles and/or animal figures inside. Working loaders and dump truck beds. Kids love trucks. Outdoor play is just as equally important for kids to exercise their minds along with their bodies. Take the fun from the farm to the park or the beach with these toy John Deere Sandbox vehicles. A real functioning front loader and dump bed are perfect for discovering and exploration to push through and pick up sand, dirt, or other materials. 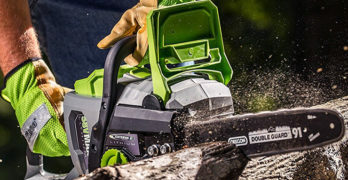 They’ll also learn more about the characteristics of different types of materials such as which are easy to maneuver and push around from sand to dirt to water. John Deere farm toys are always popular with kids. Learn more about ERTL John Deere toys by visiting their site. Encouraging your child’s development is essential to their growth and toys like these make it effortless. Children are naturally drawn to different types of toys and there is great variety here to foster your child’s imagination and skills they’ll gain for future use. While helping them learn through showing them different actions with toys, allowing them to learn on their own is equally important in developing and gaining crucial skills.